Guibert of Nogent wrote Gesta Dei per Francos, or The Deeds of God through the Franks, between 1106 and 1109. It was a revision of an earlier anonymous chronicle titled Gesta Francorum. Though his chronicle of the First Crusade was not well known in his own time, Guibert of Nogent is today one of the best known chroniclers of the crusades, perhaps due to his autobiography Monodiae, or Memoirs, which is popularly referred to as A Monk’s Confession. Guibert wrote his memoirs around 1115, which was quickly followed by his treatise against relic cults, On the Relics of Saints, in 1119. In these later works, Guibert accused Jews of using black magic; he was one of the first anti-Semitic writers to do so. Jews Identified by Rouelle are being Burned at Stake. Despite what the reader may be inclined to think, this strange story is not a passage from a poorly written erotica novel. Instead, it was taken from the memoirs of one of the most studied clerics of the twelfth century, Guibert of Nogent. Guibert was born in 1060 on the day before Easter at Clermont-en-Beauvais.2 He was the youngest son of Evard, a warrior of King Henry of France, and his wife, a highly pious woman.3 They were a noble and influential family in their locality, but they were not wealthy or highly placed.4 Evard died shortly after Guibert’s birth,5 leaving Guibert at the fringes of an already small patronage network.6 His mother never remarried; instead she focused her efforts on providing an education for Guibert and securing a private tutor for him.7 According to Guibert, his tutor agreed to teach him because of a dream in which an old man led the young Guibert to his bedside.8 Eventually, Guibert entered the Church of Saint-Germer for monastic training despite his mother’s insistence that he was not yet ready. By 1104, Guibert had obtained an appointment as the abbot of Nogent.9 For a while, Guibert struggled to be accepted as a monk and was determined to prove that he was elected abbot on “merit alone.”10 During his time at Nogent, Guibert began to funnel his intellectual efforts into his writing – writings that occurred during a turbulent time of Christian-Jewish relations, a fact that is reflected in Guibert’s attitudes toward Jews throughout his life’s work. This paper also discusses how the historical background of increasingly poor Christian-Jewish relations and the violence of the First Crusade fueled the development of Guibert’s anti-Semitic rhetoric in the twelfth century. Though Guibert of Nogent was not well known to his contemporaries, modern scholarship is fascinated by the abbot who deemed himself important enough to write a memoir before memoirs became a common literary convention. In fact, there have been several attempts to untangle the mind of Guibert of Nogent and discover the reasons behind not only his self-importance but also the fantastical stories he depicts when discussing sinners, heretics, and Jews. Then in 2009, Elizabeth Lapina published an article in The Journal of Medieval History entitled “Anti-Jewish Rhetoric in Guibert of Nogent’s Dei gesta per Francos.” In it, Lapina argued that Guibert of Nogent used the tradition of biblical exegesis to imbue his version of the Gesta Francorum with anti-Judaic rhetoric through comparisons of the weaknesses of the Maccabees and the strengths of the Christian crusaders.18This paper will expand on Lapina’s work by arguing that the previous anti-Judaic clerical sentiments of Guibert in The Deeds of God through the Franks developed into anti-Semitic rhetoric in his later works: A Monk’s Confession: The Memoirs of Guibert of Nogent, and On the Relics of Saints. In the late eleventh century, Christian-Jewish relations took a violent turn that began a fluctuation between two competing anti-Jewish attitudes.19 Anti-Judaism upheld the stance of the Church and though it considered Judaism evil, it did not find the Jewish people to be innately evil or wish for their destruction. Anti-Judaism also supported the civil Jewry laws of the Middle Ages. The foundation of civil law was the Theodosian Code, which held that Jews were part of a group of heretics, but were free to practice their religion.20 The Code also opposed forced baptism and protected existing synagogues.21 In theory, the Theodosian Code proved to be a balancing act between repression and toleration by the state. While the Theodosian Code set important precedents for the treatment of Jews in Christendom, medieval Church and civil laws regarding Jews pulled heavily on the theory of Augustinian witness. Saint Augustine believed that God allowed the Jews to survive and live amongst Christians because they were “witnesses” to the glory of Christ.22 To Augustine, the Jew’s served to authenticate the scriptures by demonstrating to enemies of the Church that biblical testimonies were not forged.23 Most importantly, Jews proved the truth of Christian scripture since “in not comprehending the truth they offer additional testimony to the truth, since they do not understand those books by which it was foretold that they would not understand.”24 In Augustine’s eyes, the rejection of Christ by the Jews as foretold by scripture proved the truth of Christianity. In the aftermath of the First Crusade, Henry IV allowed Jews forcibly converted during the 1096 massacres to return to the religion of their fathers in 1097.43 Pope Calixtus II (1119-24) also issued a bull of protection, but even canon lawyers had shifted towards harshness against the Jews.44 Clearly there was an attempt to reverse some of the harm done by the First Crusade to the Jewish populations of Germany, but lasting damage to the image of the Jew existed in the minds of Christendom. Though the attacks against the Jews during the First Crusade did not occur in Southern France, there were recorded instances of anti-Jewish violence in northern cities.45 This difference would later play a role in Guibert’s exposure to the Crusades. In the twelfth century, previous Christian-Jewish tensions worsened as Renaissance Christians suppressed their rationality in order to make their faith conform to Renaissance ideals. This irrationality worsened attitudes against the Jews as they denied the beliefs in Christ about which the Christians had their doubts.46 Irrational accusations such as ritual murder became the roots of growing anti-Semitic feelings.47 These accusations were quickly embellished with fantasies and became tied to the Jewish faith.48 Images like these, of Jewish hostility toward Christians, were at the center of negative Christian perceptions of Jews.49 Even theologians began to believe that Jews and Christians had a differing capacity for reason.50 It was during this turbulent time of Christian-Jewish relations that Guibert of Nogent lived and wrote, so it is of no surprise that his attitudes toward Jews shifted throughout his life’s work. During the twelfth century, authors began to reach back into the Old Testament to find biblical precedents for the crusaders, which eventually led to the use of the Maccabees as “proto-crusaders.”54 The Maccabees were a Jewish rebel force active in the mid-second century BCE who fought to reassert Judaism in Judea against the influence of Hellenism and the Seleucid Empire.55 The Maccabees made an apt comparison for crusaders because they used forced conversion and conquest to meet their aims, much like the crusaders.56 In his early works, Guibert followed traditional models of exegetical debate about the Old Testament.57 From the beginning of The Deeds of God through the Franks, Guibert set out to ensure that his audience understood that Jews, even the Maccabees, are lesser than their Christian counterparts. In the introduction he stated that he wrote his chronicle of the First Crusade because “[he] thought, if [he] may dare to say this, that it deserved being told with greater dignity than all the histories of Jewish warfare, if God would grant someone the ability to do this.”58 Guibert thus makes it clear that despite their accomplishments, one of his goals in writing The Deeds of God through the Franks was to elevate Christian crusaders above the well-known Jewish warriors. He does this throughout The Deeds of God through the Franks by demonstrating Jewish theological shortcomings, a technique often employed in anti-Judaic writing. Later, Guibert further emphasized the higher status of the crusaders in comparison to the Maccabees. He retold the sermon of Pope Urban II in Clermont declaring that the pope had said, “If the Maccabees once deserved the highest praise for piety because they fought for their rituals and their temple, then you too, O soldiers of Christ, deserve such praise, for taking up arms to defend the freedom of your country.”59 The pope continued on to tell the crusaders they were fighting the Antichrist. In this instance, a comparison was being drawn that the Maccabees fought for their own sake, while the crusaders fought for God as well as the protection of their country.60 This comparison elevated the crusaders for their righteous, spiritual cause while putting the Maccabees in a realm of corporeal selfishness. The differences between the Maccabees and the crusaders were frequently brought to light in Guibert’s chronicle. In yet another passage, Guibert claimed that modern men underwent greater suffering than the Jews of old.67 He elaborated by stating that the Jews had their families for company and full bellies to fight on while angels led their way into battle.68 He juxtaposed the comforts of the Maccabees with the hardship of the crusaders saying, “today’s men are the ones whom he [God] more truly saves, because he truly receives as his children those whose bodies he has allowed to be slain, and whom he punishes in the temporal world.”69 Elizabeth Lapina argued that this juxtaposition was an implication that the crusaders avoided temptations of the flesh due to circumstances and their own conscious decision, while the Maccabees continued to give into these temptations by bringing along their families.70 More literally, Guibert’s claims were another example of the hardships that the crusaders faced. When juxtaposed with the relative comfort of the Maccabees, these hardships were meant to construe the Jewish warriors as weak, unable to put their lives fully in the hands of God, while the crusaders came across as devout Christians willing to sacrifice everything for God and their cause. Throughout The Deeds of God through the Franks, Guibert made frequent parallels between the Jewish warriors, the Maccabees, and the Christian crusaders of the First Crusade. With allusions to the miracles performed for the Maccabees juxtaposed with the hardships and suffering of the crusaders, Guibert attempted to steer the reader away from the idea of the Maccabees as equals of the Crusaders and instead tried to convey a type of Christian superiority by making the Maccabees inferior “proto-Crusaders.” The Maccabees were depicted as needy, unable to succeed without God’s help yet unable to fully dedicate themselves to God. In contrast, Guibert goes into great detail about the hardships the crusaders faced and pointedly talked about the lack of miracles performed for the crusaders. However, Guibert decried the idea that God favored the Jews through his miracles. Instead these hardships were proof that the Christians crusaders were more devout than their Jewish predecessors as they were willing to fight for God without any reward and with great personal sacrifice. The presentation of Christians as superior through critical examinations of the Old Testament was typical of exegesis in the twelfth century. Guibert’s argument concerning the superiority of Christian crusaders over the Maccabees in The Deeds of God through the Franks was largely based on theological differences. The Maccabees were depicted as selfish warriors with weak faith in order to highlight the devoutness of the crusaders. However, Guibert did not suggest that the Maccabees were agents of the Devil, possessors of black magic, or sexual deviants, nor did he depict them as Christ-killers or murderers of Christians. In The Deeds of God through the Franks, Guibert’s language was anti-Judaic because it focused on what he saw as the theological shortcomings of the Jews. In contrast, in his later works Guibert’s language began to focus on the evils of the Jews as a people and not on the shortcomings of Judaism as a faith. 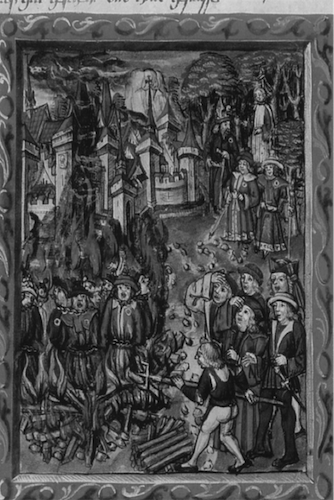 When Guibert wrote his memoirs, or Monodiae, in 1115 he was certainly proficient in weaving a tale about Jews engaging in black magic on behalf of the devil. In fact, Guibert’s memoirs spoke more about other figures and their sins than himself.73 After the first book, Guibert spent most of the memoir reflecting on the sins of various clerics, Christians, and Jews. The first mention of a Jew in the second book of Monodiae was rather mild. It recounted a great storm that hit a monastery while the monks were walking to the high altar to sing the litanies.74 Lightning struck the altar, blinding a priest and sending two young boys flying across the room.75 It is interesting that Guibert chooses this story to describe one of the altar boys as “a converted Jew, but… deeply devout.”76 Though Jews only entered Guibert’s social world after they converted,77 he still felt that he needed to not only mention that they were once Jewish, but that they were devoted to the Christian faith. This suggests that Guibert still did not trust even converted Jews. It is interesting to note that in one of Guibert’s earlier works, Moralia, he described three stages that led to committing sin.87 “Affection” tempted Will before captivating it through beauty and pleasure, leading Will to accept Affection’s earlier suggestions of sin.88 Reason must then agree to follow Will and Affection into sin.89 In this case, it appeared that Affection was the Jewish doctor whom the monk befriended. However, the monk’s own Will and Reason must agree to follow the Jew to sin, so Guibert cannot lay blame for the priest’s fall solely on the Jew, but did frame the Jew as a seducer and Devil’s agent. This was a common trope in Guibert’s memoirs that enabled him to construct a perceived Jewish threat to Christian selfhood.90 By doing so, Guibert was able to reconcile his previously held views on morality with his anti-Semitic views of Jews as an evil people. The introduction of this passage also revealed Guibert’s views of Jews as inhuman monsters by indirectly comparing Jews to demons;91 the introduction of the tale attributed the stripping of baptismal vows to the work of demons, while the Jewish doctor facilitated the stripping of the priest’s baptismal vows in the anecdote itself. Despite this negative outlook, Guibert did make exceptions to his presentation of Jews as vile corrupters when he remarked on converts in monasteries. Guibert did not approach Guillaume in the same way that he approached most Jews in Monodiae. In fact, in the majority of Guibert’s works, Jews were depicted as inarticulate, mean spirited, and lacking all reason.105 However, Guibert did not treat the boy with suspicion, imply the use of dark magic, or associate him with sin and the Devil. It seems Guibert held Guillaume in high regard, as a rational scholar, sending him his own writings as an educational tool. It was in this passage that Guibert came closest to the descriptions of other Christian authors of the time – the Jew as an intelligent and sympathetic figure.106 Guillaume’s acceptance and reverence for Guibert’s tract against the Jews seemed to seal Guibert’s high opinion of Guillaume leading him to exclaim that the wax cross at Guillaume’s baptism was divinely willed. Though Guibert accepted Guillaume as a devout Christian, at points even seeming proud of the development of Guillaume’s faith, he casually reminded the reader of the typically stubborn and sinful Jew by pointing out the rarity of such a successful conversion. The mention of Jean’s mother and her dealings with Jews also served to highlight the potential for Jewish contact to debase the Christian body. The countess’ deal with a Jew eventually led to a stroke that nearly cost her tongue and sent her into madness. Likewise, Jean’s affair facilitated by a Jew, in combination with his approval of Judaism drove him mad before the Devil claimed his soul. Modern scholarship is fascinated with Guibert of Nogent, a fascination that has led to articles and books by scholars such as John Benton, Heather Blurton, Steven Kruger, Elizabeth Lapina, and Jay Rubenstein. Many attempts have been made to unravel the mind of Guibert and unearth the roots and extents of his beliefs. A large focus of these attempts centers on Guibert’s attitudes regarding Jews. This paper builds off of Elizabeth Lapina’s argument in “Anti-Jewish rhetoric in Guibert of Nogent’s Dei gesta per Francos” by examining rhetoric in The Deeds of God through the Franks in combination with Guibert’s memoirs, Monodiae, and his tract against relic cults, On the Relics of Saints, to trace the development of Guibert of Nogent’s anti-Semitic attitudes. In The Deeds of God through the Franks, Guibert largely adheres to the tradition of Old Testament biblical exegesis. Focusing on the Maccabees as “proto-crusaders,” Guibert describes their spiritual weakness and corporeal selfishness to emphasize the superiority of Christian crusaders over the Jewish warriors of old. Though Guibert actively seeks to promote Christian superiority, his rhetoric focuses on the theological shortcomings of Judaism and the perceived shortcomings of those who practice it. He does not attribute any sins or wrongdoings to an evil inherent among the Jewish people. Guibert’s language in Monodiae shows a shift in his perceptions. While Guibert still believes that Judaism is inferior to Christianity, his rhetoric shows that he now attributes Jewish sins to an evil inherent in the Jewish people. He accuses Jews of knowing black magic, of creating parallels between themselves and the animalistic and inhuman, and of frequently connecting the debasement of a Christian body with friendliness with Jews. While Guibert does mention two converted Jews and their devotion to the faith, he emphasizes the rarity of such an event. A few years after Monodiae, Guibert wrote On the Relics of Saints. In this tract, one of the few mentions of Jews accuses them of falsely converting in hopes of monetary gain. Guibert gives no evidence for this accusation, seeming to rely on the inherent truth of the statement with his reader. This accusation aligns with wider anti-Semitic stereotypes of the greedy Jew that arose in the Middle Ages. All of Guibert’s charges against Jews in Monodiae and On the Relics of Saints show a detachment from the earlier anti-Judaic rhetoric of The Deeds of God through the Franks. Rather than focusing on theological shortcomings, Guibert turns to fanciful charges of black magic, inhuman characteristics, physical Christian debasement, dealings with the Devil and stereotypes of greed. Any evidence outside of the accused being a Jew does not back these charges. However, Guibert does relate two successful conversion stories. Guibert’s rhetoric clearly shifts from anti-Judaic to anti-Semitic in his later works, but he is not yet as fanatical as anti-Semitic writers in later years, such as Thomas of Monmouth.129 The shift in Guibert’s rhetoric from his early anti-Judaic works to his later anti-Semitic works makes sense in the context of Guibert’s life; he lived and wrote in the 11th and 12th centuries, a turbulent time for Christian-Jewish relations. Thus, Guibert’s shift in rhetoric is not solely a reflection of Guibert’s personal beliefs, but a larger reflection of his world. Guibert, Abbot of Nogent-sous-Coucy. The Deeds of God through the Franks: a Translation of Guibert de Nogent’s Gesta Dei per Francos. Trans. Robert Levine. Woodbridge, Suffolk, UK: Boydell Press, 1997. Guibert, Abbot of Nogent-sous-Coucy. A Monk’s Confession: The Memoirs of Guibert of Nogent. Trans. Paul J. Archambault. University Park, Pennsylvania: The Pennsylvania State University Press, 1996. Guibert, Abbot of Nogent-sous-Coucy. On the Relics of Saints. Trans. Joseph Mcalhany and Jay Rubenstein. New York: Penguin Books, 2011. Abulafia, Anna Sapir. Christian-Jewish Relations 1000-1300: Jews in the Service of Medieval Christendom. Great Britain: Pearson Education Limited, 2011. Abulafia, Anna Sapir. “Twelfth-Century Renaissance Theology and the Jews.” In From Witness to Witchcraft: Jews and Judaism in Medieval Christian Thought, ed. Jeremy Cohen, 125-139. Wiesbaden: Harrassowitz Verlag, 1996. Albert, Bat-Sheva. “Christians and Jews.” In The Cambridge History of Christianity, ed. Thomas F.X. Noble and Julia M.H. Smith, 157-177. Cambridge University Press, 2015. Benton, John F. “The Personality of Guibert of Nogent.” Psychoanalytic Review, 57.4 (1970): 563-586. Blurton, Heather F. “Guibert of Nogent and the Subject of History.” Exemplaria: A Journal of Theory in Medieval and Renaissance Studies, 15.1 (2003): 111-131. Chazan, Robert. The Jews of Medieval Western Christendom, 1000-1500. New York: Cambridge University Press, 2006. Cohen, Mark R. Under Crescent and Cross: The Jews in the Middle Ages. Princeton: Princeton University Press, 1994. De Lange, Nicholas, ed., The Illustrated History of the Jewish People. New York: Harcourt Brace, 1997. Hornblower, Simon, Antony Spawforth, and Esther Eidinow, ed., “Maccabees” in The Oxford Companion to Classical Civilzation 2nd edition. Oxford: Oxford University Press, 2014. Kruger, Steven F. “Medieval Christian (Dis)Identifications: Muslims and Jews in Guibert of Nogent.” New Literary History, 28.2 (1997): 185-203. Lapina, Elizabeth. “Anti-Jewish rhetoric in Guibert of Nogent’s Dei gesta per Francos.” Journal of Medieval History, 35 (2009): 239-253. Maccoby, Hyam. “Anti-Judaism and Anti-Semitism.” European Judaism: A Journal for the New Europe, 18.2 (1985): 27-30. Madden, Thomas F. The Concise History of the Crusades. 3rd edition. New York: Rowman & Littlefield, 2014. Rubenstein, Jay. Guibert of Nogent: Portrait of a Medieval Mind. New York: Routledge, 2002. Elyse Sulkey is a graduating senior at the University of North Carolina at Chapel Hill. Her research interests include exploring aspects of medieval European culture such as art, literature, and rhetoric. 1 This anecdote was taken from: Guibert, Abbot of Nogent-sous-Coucy. A Monk’s Confession: The Memoirs of Guibert of Nogent, trans. Paul J. Archambault (University Park, Pennsylvania: The Pennsylvania State University Press, 1996), 89-90. 2 Jay Rubenstein, Guibert of Nogent: Portrait of a Medieval Mind. (New York: Routledge, 2002), 17. 4 John Benton, “The Personality of Guibert of Nogent.” Psychoanalytic Review, 57.4 (1970), 567. 5 In “Guibert of Nogent and the Subject of History” Heather Blurton argued that Guibert developed a fascination and obsession with sexual mutilation, money, and fear of death due to his father’s early death and Guibert’s subsequent rearing by a strict and pious mother and tutor. Blurton’s argument is similar to that of John Benton’s earlier article “The Personality of Guibert of Nogent,” in which Benton discusses the possibility that Guibert suffered from an Oedipus complex that influenced his views of the world. It is worth noting that both Benton and Blurton postulated that psychological damage from Guibert of Nogent’s early years may account for his hatred of the “other” and the fantastical charges he brought against them. 6 Rubenstein, Portrait of a Medieval Mind, 17-18. 7 Benton, “The Personality of Guibert of Nogent,” 567. 8 Rubenstein, Portrait of a Medieval Mind, 18. 9 Benton, “The Personality of Guibert of Nogent,” 574. 10 Blurton, “Guibert of Nogent and the Subject of History,” 115. 11 Benton, “The Personality of Guibert of Nogent,” 566. 12 Another work of importance for this topic is Guibert’s 1111 On Jews and Judaizers. In Guibert of Nogent: Portrait of a Medieval Mind, Jay Rubenstein describes the arguments of other scholars that Guibert’s tract against the Jews was a turning point in Christian-Jewish relations because it was the first tract to belittle and dehumanize Jews rather than treat them as respected theological colleagues. However, On Jews and Judaizers was not included in this paper because an English translation could not be located. 13 Benton, “The Personality of Guibert of Nogent,” 563-586. 14 Exegesis refers to the critical interpretation and explanation of a text, typically scripture. 15 Steven F. Kruger, “Medieval Christian (Dis)Identifications: Muslims and Jews in Guibert of Nogent.” New Literary History, 28.2 (1997), 185-203. 16 Rubenstein. Portrait of a Medieval Mind. 17 Heather F. Blurton, “Guibert of Nogent and the Subject of History,” Exemplaria: A Journal of Theory in Medieval and Renaissance Studies, 15.1 (2003), 111-131. 18 Elizabeth Lapina, “Anti-Jewish rhetoric in Guibert of Nogent’s Dei gesta per Francos,” Journal of Medieval History, 35 (2009), 239-253. 19 Bat-Sheva Albert, “Christians and Jews,” in The Cambridge History of Christianity, ed. Thomas Noble et al. (Cambridge University Press: 2015), 160. 20 Mark R. Cohen, Under Crescent and Cross: The Jews in the Middle Ages (Princeton: Princeton University Press, 1994), 32-33. 23 Jeremy Cohen, Living Letters of the Law: Ideas of the Jew in Medieval Christianity (Berkeley: University of California Press, 1999), 29. 25 J. Cohen, Living Letters of the Law, 32. 28 Gavin Langmuir, History, Religion, and Antisemitism (Berkeley: University of California Press, 1990), 293. 29 Anna Sapir Abulafia, Christian-Jewish Relations 1000-1300: Jews in the Service of Medieval Christendom (Great Britain: Pearson Education Limited, 2011), 145. 30 Albert, “Christians and Jews,”168. 33 Thomas Madden, The Concise History of the Crusades (New York: Rowman and Littlefield, 2014), 18. 36 Abulafia, Christian-Jewish Relations, 140. 37 Albert, “Christians and Jews,” 169. 40 Robert Chazan, The Jews of Medieval Western Christendom, 1000-1500 (New York: Cambridge University Press, 2006), 67. 41 Albert, “Christians and Jews,” 169-170. 43 Abulafia, Christian-Jewish Relations, 143. 44 Cohen, Under Crescent and Cross, 37-40. 45 Abulafia. Christian-Jewish Relations, 140. 46 Anna Sapir Abulafia, “Twelfth-Century Renaissance Theology and the Jews,” in From Witness to Witchcraft: Jews and Judaism in Medieval Christian Thought, ed. Jeremy Cohen (Wiesbaden: Harrassowitz Verlag, 1996) 128-129. 48 Chazan, The Jews of Medieval Western Christendom, 214. 50 Abulafia, “Twelfth-Century Renaissance Theology and the Jews,” 131. 51 Hyam Maccoby published an excellent article detailing the differences between anti-Judaism and anti-Semitism in European Judaism: A Journal for the New Europe. It is entitled “Anti-Judaism and Anti-Semitism” and can be found in volume eighteen issue two of the 1985 journal. 52 Maccoby, Hyam. “Anti-Judaism and Anti-Semitism.” European Judaism: A Journal for the New Europe 18.2 (1985), 27-30. 54 Lapina, “Anti-Jewish rhetoric in Guibert of Nogent’s Dei gesta per Francos,” 241. 55 Simon Hornblower, Antony Spawforth, and Esther Eidinow, ed., “Maccabees” in The Oxford Companion to Classical Civilzation 2nd edition (Oxford: Oxford University Press, 2014). 56 Nicholas De Lange, ed., The Illustrated History of the Jewish People (New York: Harcourt Brace, 1997), 28-32. 57 Rubenstein, Portrait of a Medieval Mind, 116. 58 Guibert of Nogent, The Deeds of God through the Franks: a translation of Guibert de Nogent’s Gesta Dei per Francos. Trans. Robert Levine (Woodbridge, Suffolk, UK: Boydell Press, 1997), 25. 60 Lapina, “Anti-Jewish Rhetoric in Guibert of Nogent’s Dei gesta per Francos,” 247. 61 Guibert, The Deeds of God through the Franks, 107. 66 Lapina, “Anti-Jewish Rhetoric in Guibert of Nogent’s Dei gesta per Francos,” 247. 67 Guibert, The Deeds of God through the Franks, 143. 70 Lapina, “Anti-Jewish Rhetoric in Guibert of Nogent’s Dei gesta per Francos,” 250. 71 Guibert, The Deeds of God through the Franks, 145. 72 Lapina, “Anti-Jewish Rhetoric in Guibert of Nogent’s Dei gesta per Francos,” 251. 73 Blurton, “Guibert of Nogent and the Subject of History,” 116-120. 74 Guibert, Abbot of Nogent-sous-Coucy. A Monk’s Confession: The Memoirs of Guibert of Nogent. Trans. Paul J. Archambault (University Park, Pennsylvania: The Pennsylvania State University Press, 1996), 83. 77 Kruger, “Medieval Christian (Dis)Identifications,” 192. 78 Guibert, A Monk’s Confession, 89. 83 Kruger, “Medieval Christian (Dis)Identifications, 188. 87 Rubenstein, Portrait of a Medieval Mind, 44-47. 90 Kruger, “Medieval Christian (Dis) Identifications”, 194. 91 On Guibert’s views of Jews as inhuman monsters, see Steven Kruger’s “Medieval Christian (Dis)Identifications”, 189. 92 Abulafia. Christian-Jewish Relations, 141. 93 Guibert, A Monk’s Confession, 111. 94 See earlier discussion of the Crusaders and anti-Semitic pogroms on page 7. 95 Abulafia. Christian-Jewish Relations, 141. 96 Guibert, A Monk’s Confession, 112. 105 Rubenstein, Portrait of a Medieval Mind, 120. 107 Guibert, A Monk’s Confession, 193. 117 Cohen, Living Letters of the Law, 193. 118 Kruger, “Medieval Christian (Dis)Identifications, 189. 120 Rubenstein, Portrait of a Medieval Mind, 115. 121 Kruger, “Medieval Christian (Dis)Identifications,” 188-193. 122 Guibert, A Monk’s Confession, 90. 124 Benton, “The Personality of Guibert of Nogent,” 566. 125 Guibert, Abbot of Nogent-sous-Coucy, On the Relics of Saints. Trans. Joseph Mcalhany and Jay Rubenstein (New York: Penguin Books, 2011), 230. 126 For a discussion of Guillaume, see page 20. For a discussion of the young convert, see page 16. 127 Cohen, Living Letters of the Law, 224. 129 Thomas of Monmouth is the author of The Life and Miracles of Saint William of Norwich. Written around 1150, it recounts the 1140 murder of a young boy, William of Norwich, supposedly at the hands of local Jews who traditionally crucified Christian children near Easter in order to mock Christ. It is considered to be the first appearance of the anti-Semitic charge of blood libel.